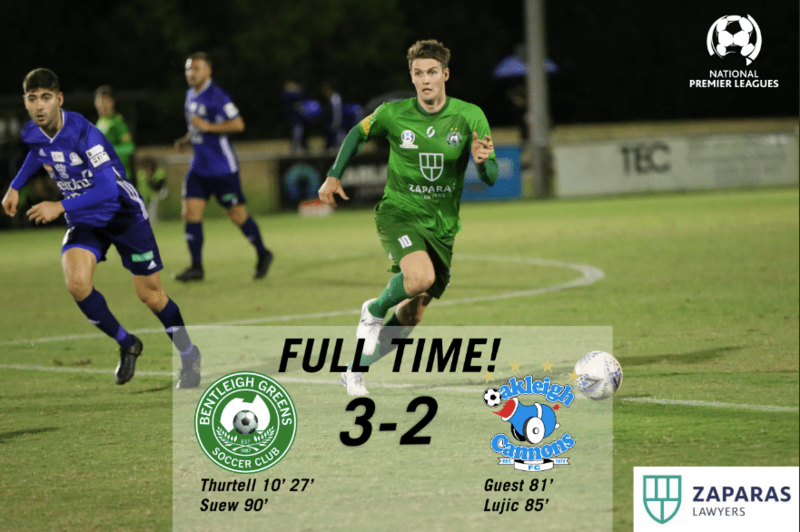 Friday night Football returned to Kingston Heath Soccer Complex on Friday night with Bentleigh looking to get back on the winner’s list following a 2-2 draw with Dandenong Thunder the week prior. The Greens wasted no time getting the ball rolling with Matt Thurtell putting the Greens in front after 10 minutes. He made no mistake prodding home a rebound after Marco Jankovic’s thunderous header clattered off the cross bar from a corner. 17 minutes later and Thurtell was back at it again after Jacob Alexander regained the ball in midfield. The Bentleigh full back played a ball through the middle of a scarce Cannons defense which found Thurtell who had no problem rolling past Cannons stopper John Honos from a tight angle. The Greens had another opportunity before the break with George Lambadaridis unleashing a rocket from the edge of the area however Honos was equal to the task. The 2nd half started with Cannons captain Tom Matthews receiving his marching orders after bringing down Lambadaridis on half way for his 2nd yellow card of the night. On 80 minutes Marco Jankovic received his 2nd yellow card for the Greens and it was 10-men apiece for the last 10 minutes. Cannons English-import Joe Guest stepped up from the resulting free kick and buried it in Ryan Scott’s right hand corner to make it a very tense finale. 4 minutes later and Jacob Alexander was adjudged to have brought down Joe Guest in the box and was given a straight red card. Substitute Milos Lujic stepped up and made no mistake burying his spot kick to make it 2-2. However against all odds and with what turned out to be almost the last kick of the game German-import Arnold Suew put the Greens back in front with a neat back heel after good work from Tyson Holmes and Velibor Mitrovic in the build up. Bentleigh travel to Altona next Saturday to take on Altona Magic at Paisley Park.